Frequently when working in watermedia the paint has a mind of its own. It runs around the paper doing all kinds of things you haven't planned. Normally this is just what watermedia artists love in the finished work because the appearance is something you can't achieve with other media. However, other times the paint does things that seem overwhelming. 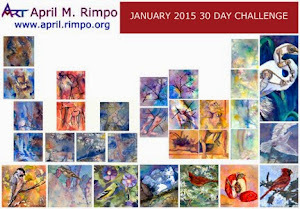 This blog describes such an accident that would have made me stop the painting when I first started to use watercolor. 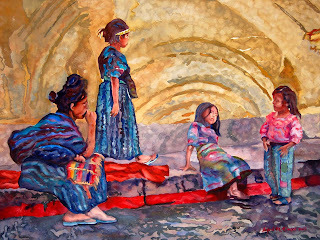 The slideshow below shows a portion of a recent painting of a Guatemalan Family where the fluid acrylic yellow ochre background ran across the woman's wrist and across the waist of the standing woman. The acrylic dried so quickly I was only able to wash it off the standing woman's waist, but not off the wrist. The acrylic had absorbed into the cold press watercolor paper within s few seconds. I feared I had a disaster on my hands. Since I had just started the painting I considered stopping and starting over, then thought I might as well keep painting and see what happens. At the time of the first photograph in the slideshow I had put a pale flesh colored wash over her face and her arm to see whether it had any affect on the yellow ochre acrylic run across her wrist. You can see the run was still very obvious. I decided to let the paper dry thoroughly and then continue to paint the woman's dark skin tones and clothing to see whether it covered the acrylic run. All of this was done in transparent watercolor since that was my desired medium for the figures in the painting. To my surprise, the transparent watercolor had covered most of the run. It is only obvious on the right edge of the wrist. See the second painting in the slideshow. 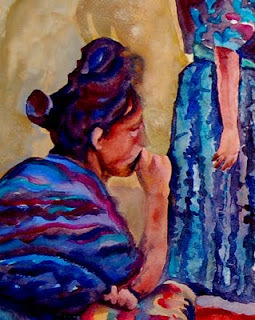 I knew the skirt of the standing woman would be dark blue, so I kept painting. At the time of the third photograph only the light part of the skirt was complete, but the blouse of the standing woman was done. The faint run of acrylic at the waist of that figure can no longer be seen. In the last photograph, the dark skirt is complete and the yellow ochre acrylic is no longer obvious. Its essential not to panic and try to scrub out the paint or paint back in too quickly. The result will be to damage the paper and then the eye will be drawn to the damaged paper and an overworked spot will always standout.